Following a number of months of filming and post production work, English black belt and 'Hall of Fame' recipient Master Athos Antoniades, 9th dan chief instructor of the Association of Kenpo Taji in London, has just realised his eagerly awaited 'Ultimate Street Survival Fighting Programme' DVD’. "Our latest DVD is a completely self-contained ultimate self-defence programme which is based on Kenpo Taiji's system of fighting and self-defence," the 9th degree explained. "The system isn't based purely on physical strength, as obviously if that were the case, the stronger and bigger person would always win. 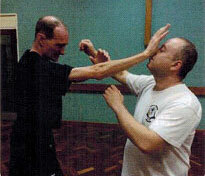 Kenpo Taiji is 50 per cent physical and 50 per cent mind." Black belt teacher and 'Hall of Fame' recipient Master Athos Antoniades, 9th dan chief instructor of the Association of Kenpo Taji in London, England, has just realised his eagerly awaited 'Ultimate Street Survival Fighting Programme' DVD. 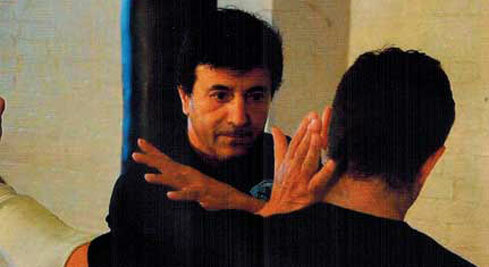 Antoniades continued: "In other words, as well as learning how to punch, kick, and so on, student will also learn how to release the 'wild animal' within them by entering the reptilian part of the human triune brain (made up of the neomallian, paleomallian and reptilian) the existence of which is verified by Western science." The long time black belt instructor says that his Ultimate Street Survival Fighting Programme will enable individuals to protect themselves and their loved ones from attack with maximum efficiency and effectiveness. "Your body will instinctively move in an integrated and connected manner without thought," he said. "Just like a wild animal doing whatever it takes to survive, using - not anger - but reptile aggression combined with power, speed and perfect timing." According to Antoniades the reptilian brain acts in accordance with how the other two part of the brain are programmed. As the paleomallian part of the subconscious is our body and our artistic mind, training methods developed by ancient Chinese masters using body movement methods will be explained and taught. "These unique training methods will subconsciously programme this particular part of the brain with fighting principles and enable the student to fight at a 'no mind', subconscious, reflex level. Using reptile brain mode, students when at-tacked will instinctively use maximum aggression, power, speed and perfect timing." "-Your attacker will find themselves confronted literally by a raging wild animal and not the placid human being he thought he (she) was attacking," Antoni-ades explained. One of the training methods the Londoner teaches is to combine the reptile brain with adrenalin, some-thing he says is "a very powerful combination". One of Athos Antoniades' students demonstrates a strike to the point, 'governor vessel 26'. "This technique gives the student super strength but only for a short space of time," he said. "Because we need to deal with, and neutralise, an attack in a short time span, the training method programmes the individual's subconscious to aim their strikes using 'Dim Mak' or pres-sure points. There are over 700 of these points throughout the body. These can be struck using the explosive energy releasing power of `fajing'. The DVD shows the viewers how to use the body to transfer adverse energy into the attacker's Dim Mak points by using fajing for instant knockout, or worse if the situation war-rants it." Viewers will be shown how to reflexively and instinctively apply this way of fighting to all attacks whether empty hand, knife, or other weapons. "Never before has so much genuine information, which delves so deeply into the awesome insight that has enabled the martial arts to stand the test of time, been revealed in one programme," Antoniades said. The training programme is suitable for all irrespective of size, age or gender. "If you're already practicing a martial art, you'll be able to incorporate these fighting principles, and way of fighting, into your own particular art." Antoniades said that by "adhering strictly to the way of fighting taught in the programme, instead of attempting to formalise it by the use of logical, pre-arranged techniques, there's no way you can lose any fight." "The very instant an attacker comes within range you will be able to attack with the full ferocity of the reptilian brain, using the explosive energy releasing power of fajing to attack Dim Mak points at a subconscious reflex level while using a rapid succession of strikes until the attacker is totally subdued." While the viewer is watching Antoniades' Street Survival Fighting Programme they will also be listening to a subliminal persuasion message recording by the renowned and highly regarded hypnotherapist Barrie Konicov, author of 'Inner Dance of the Martial Arts Master'. "Although to the conscious mind the sound track seems like pleasant relaxing music, it will, in fact, be programming the listener's subconscious mind to fight with maximum efficiency at a 'no mind', sub-conscious, reflex level. Excellent health and fighting ability are a by-product of the true essence of the Tai Chi, Wuji and Chi Kung taught in our system. The true aim is to subdue the ego and allow the light of consciousness to transcend the person allowing the soul to take over and lead us through life. Our thinking will be from a state of conscious presence and not our logical thinking brain often referred to as the Ego.